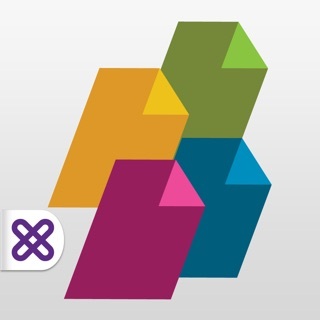 Infragistics SharePlus is a mobile productivity solution that transforms how individuals and teams work on the go through instant content access and discovery – with or without connectivity. 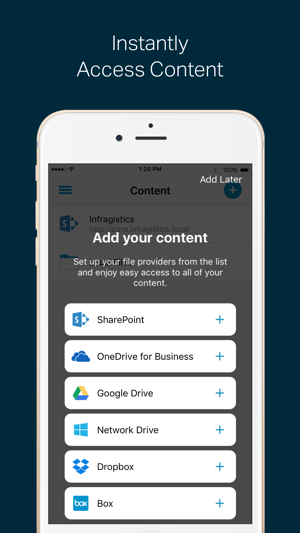 SharePlus Pro lets you securely work from anywhere with the information you need regardless of where it’s located - on SharePoint or Office 365, OneDrive for Business, Google Drive, Dropbox, Box, Network drives, or other corporate data sources. You can even edit your SharePoint content offline and sync when you’re back online. 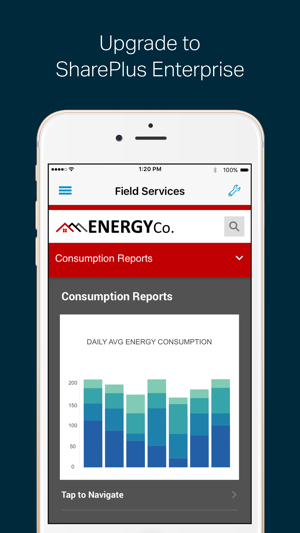 Quickly and securely access all of your content from just one app. • Access and edit all types of SharePoint and Office 365 content, including documents, tasks, contacts, calendars, surveys, discussions, announcements, libraries, and more. 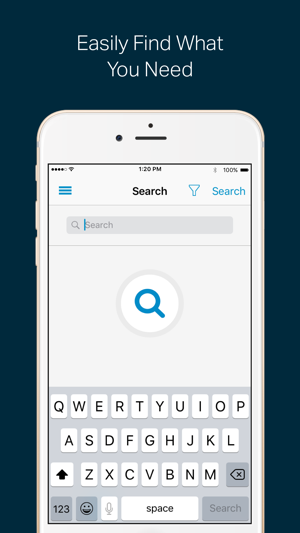 • Easily find what you need with Recents and Favorites. 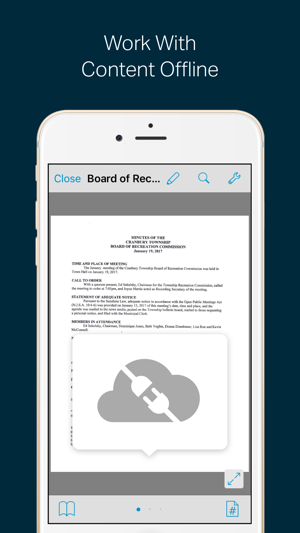 • View and annotate PDF files without leaving SharePlus. 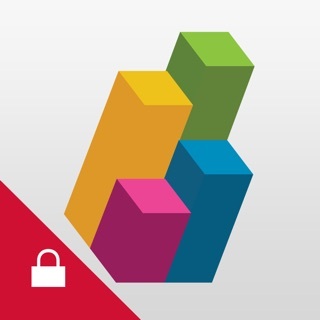 • Enjoy built-in security with on device encryption and app-level Passcode Lock. • Share portal configuration among all your devices. With SharePlus, there is no need to install server components or request special permissions. Join 1.5+ million SharePlus users in Fortune 500 organizations! The free version of SharePlus is a great way to try out the core features of the app before purchasing a subscription. With the free version, you get access to ten content items. Upgrade to a SharePlus Pro subscription to enjoy unlimited access to your content. Upgrade to a SharePlus Enterprise subscription to use workspace templates and a single administration tool to centrally manage SharePlus for your organization. SharePlus Enterprise enables you to quickly configure, manage, customize and deploy your mobile collaboration solution. SharePlus Enterprise integrates with leading mobile device management (MDM) solutions. Core security features provide secure access to mobile SharePoint sites with encryption, permissions, application-level policies, secure data wipe and shared device support. The solution also includes a powerful tool that enables teams to build and share data visualizations that can monitor and analyze data from multiple sources in real time. The SharePlus subscription is optional, and the subscription features are available via an auto-renewing subscription at $17.99/year for SharePlus Pro and $59.99/year for SharePlus Enterprise. Subscription payments will be charged to your credit card through your iTunes account after confirmation of purchase. Your subscription will automatically renew unless cancelled at least 24 hours before the end of the current period. Manage your subscription in your iTunes Account Settings after purchase. Subscriptions cannot be cancelled for the current active period. Until I started using this app I really looked at SharePoint as a view only tool for my iPad and my iPhone. I couldn't edit documents or save anything locally, just view docs, not to mention that it would take me 5 zooms and 10 taps to actually open the file I wanted to view. Most times I would just give up and wait until I got back to the office. Then I got ahold of this app. The user experience is so intuitive and it's very easy to use in a touch environment. I can edit all of my docs, save them locally if I need to and also work offline after I sync the files I want access to. This is such a great feature for when I'm traveling. I can write up all my meeting reports for my manager during my flights, have them autosync when I land and actually relax when I get home. There's also this really slick WiFi sharing feature for creating a temporary URL where you can share docs with others that really takes care of the no USB issue with iPads.